More than 90 people converged on Miami earlier this month for the Farelogix “Controlling Your Offer Symposium”. 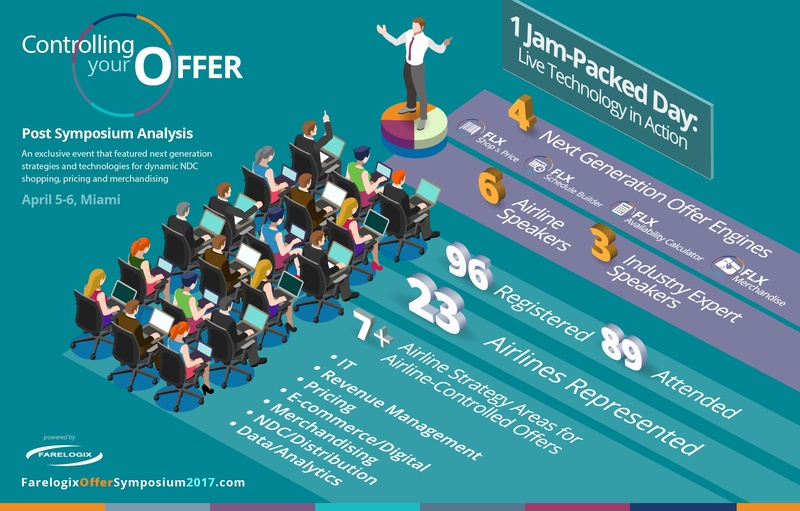 This was the industry’s first event dedicated to technology for airline-controlled offers, and it was a huge success. Attendees included senior executives from 23 airlines, representing IT, revenue management, pricing, e-commerce, merchandising, and NDC/distribution. The event kicked off with our CEO, Jim Davidson, explaining that the offer is a virtual, electronic contract between an airline and its customers. An offer is unique, dynamically created in real time, and relevant. And since most airlines today do not control the offer, they cannot guarantee the price of an offer in search until later on in the process. The big takeaway for attendees was that it’s really hard to stand behind an offer if you don’t create it. Henry Harteveldt, Principal at Atmosphere Research Group, spoke about activating the offer and its role in distribution and revenue management. He explained that airlines are “doing business in the era of Beyoncé, but are constrained by Beatles-era technology.” He discussed the factors enabling a new era of active retailing, and in particular focused on the importance of mobile as both a channel and catalyst for building better relationships between consumers and airlines. Mike Wittman with the International Center for Air Transportation at MIT focused on the science behind the offer and dynamic pricing. He explained that dynamic pricing goes back to “who’s asking” – looking at everything from the point of origin and search pattern to frequent flyer number. He also examined the role of offers in driving revenue gains, increasing yield, reducing load factors, and more. Scott Garner, President, Data & Analytics at ADARA enlightened attendees on the Traveler Value Score, a powerful new metric that accurately assesses the customer’s potential value as a traveler. Following an overview and then live demo of the next generation Farelogix pricing, merchandising, availability calculation, and schedule building engines, spokespersons from American Airlines, Air France-KLM, WestJet, Emirates, and United shared their stories of innovation after taking control of their offers. Thank you to everyone that took the time to attend our event.